The Myths Brainstorming Machine is part of Scholastic's Myths, Folktales and Fairytales, which has many excellent resources for young writers. You'll find Myth Writing with Jane Yolen, Fairy Tale and Fable Writing with John Sciezka, Folktale Writing with Alma Flor Ada and Rafe Martin, Exploring Everyday Follore with Nina Jaffe, and a Storytelling Workshop with Gerald Fierst, as well as more ways to learn about these fascinating tales. There's even a teacher's guide, and a related book list. I urge you to explore the workshops with your children/students, because it gives them access to advice from experts, set at their level. There are engaging examples and step-by-step instructions, as well as humour and a lovely atmosphere of "we're all writers together" - which reminded me of how powerful naming children as writers really is. Children are urged to contribute their own tales (with parental/teacher permission) and Scholastic provide a gallery of submitted work. It will likely come as no surprise to you that my favourite part of the site was the interactive part - the Myths Brainstorming Machine. In a nutshell, it's a way to generate a picture with a setting, hero and monster. This then leads to a story outline that kids can print out so they can begin writing their myth. It doesn't have a lot of choices, so kids may not find the myth characters they want, but the machine works easily, and there is lots of support in the form of a step-by-step tutorial. Kids might prefer to use the picture they generate for a story unrelated to the outline, one where they let their imaginations dictate what's happening. You may also be interested in my review of the Myths and Legends Website. Yes it does, Joy. I love the Myths and Legends site too - let's face it, I love ALL these wonderful interactive websites that encourage creativity! That's great to know, Melissa! 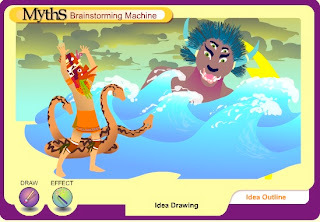 I didn't realize that Scholastic had a Myths machine, what fun! Scholastic is a hugely generous site - so much to explore!